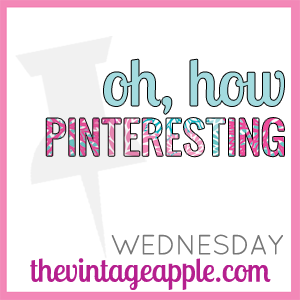 This is the first time I'm linking up with The Vintage Apple's Linky for the first time. I used to try to hide my obsession with Pinterest, but I realize now it's no use! I'm obsessed! I have a confession, though. . . . . I actually tend to be more of a hoarder of pins than a doer of pins. There. I said it. We're starting a unit on measurement (volume, area, perimeter) next week. 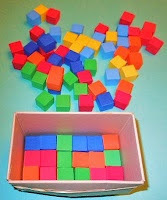 This first idea comes from Learning Ideas - K-8: Using manipulatives to teach volume. I really like how hands on & concrete this activity is. This is in the plans for next week. I also really like this anchor chart I found. I'm still a novice at creating cute anchor charts. Why do mine never come out as beautiful as the ones I see on Pinterest and out in the blogosphere? Sigh. Oh well, at least I can model mine after the beautiful ones I see. This one is from Resourceful Ragland. Oh. My. Gosh! Do these look yummy, or what?! And they're made in the crockpot, too! Score! 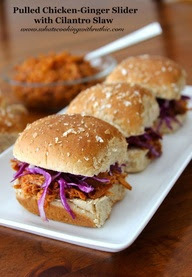 Pulled Chicken-Ginger Sliders with Cilantro Slaw. You can find the recipe at What's Cooking With Ruthie. I really, really, should put this on our menu for next week.Wouldn't it be awesome to come home from a long day & have these ready for you? Mmmm. I found this idea at Second Story Window. How fun would this be for them? They 'read' the order and then create the pizza. I think they would just LOVE this. I imagine them having tons of fun. Maybe I can get this done in time for their Easter baskets. "Great quiet time or restaurant activity"! YES! A godsend, I tell you! And so easy to make, too! 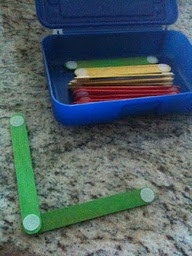 Just velcro dots on the ends of colored popsicle sticks. So why doesn't Grandma get with it and get this project done? Maybe I will. I could easily add the supplies to my shopping cart and get it done this weekend. I'll keep you updated and post pics if when I get it finished. Click over the Vintage Apple & check out tons of other Pinteresting finds! Make sure you also stop by Primary Graffiti & check out her Flash Giveaway!